Just opened today in Fitzrovia is a new cafe serving reasonably-priced food with a Portuguese influence. Jaoquim Ramos previously ran a cafe in Tottenham Court Road but has now taken over the Bay Leaf Cafe around the corner in Tottenham Street. Bon dia! Janaina Magage, Joaquim Ramos, and Joao Loureiro. “I came to London when I was 18 and worked in a variety of places, including Ponti’s in Covent Garden,” he told Fitzrovia News. “For the past 25 years I had my own cafe in Tottenham Court Road near to Goodge Street tube station,” says Ramon who is originally from a village in the north of Portugal. 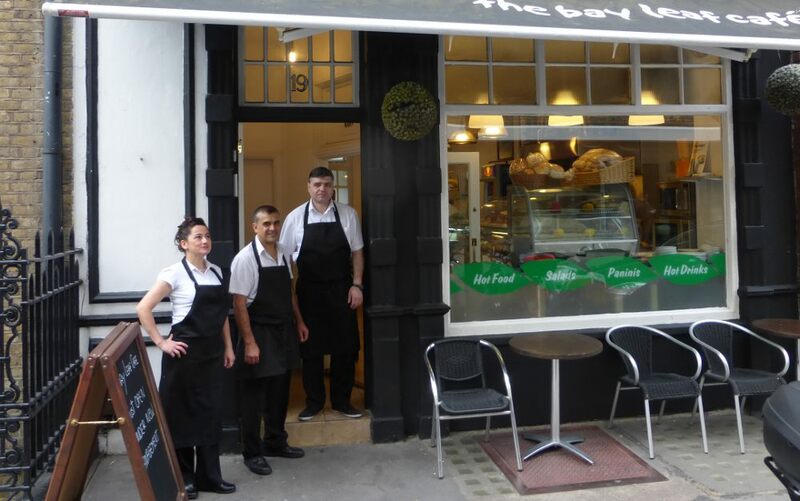 Now along with his staff Janaina Magage, Joao Loureiro and chef Manuel Pires, who all come from Portugal, they have taken over The Bay Leaf Cafe which they’ve just spent the last few weeks refurbishing. The food on offer includes a range of cooked breakfasts, snacks, sandwiches and lunches including vegetarian to serve the busy daytime working community in Fitzrovia. They brew a good cup of tea and serve fresh coffee from an espresso machine. The Bay Leaf Cafe, 19 Tottenham Street, Fitzrovia, London W1T 2AN. Open 6am to 5pm Monday to Friday, 7am to 3pm Saturdays. Closed on Sundays. 020 7436 6844. Free wifi.